Hello December 1st! Here in Maine, it feels and look like winter is in full swing. Looks like it should a Christmas photo? Nope. This would be a Thanksgiving morning photo! Craziness. 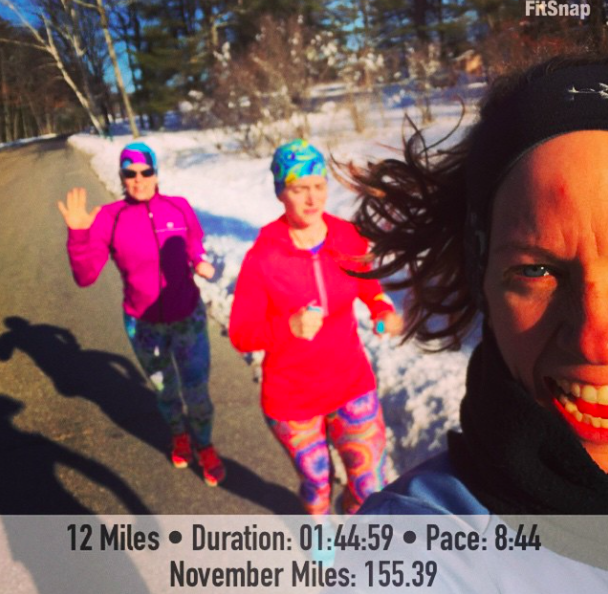 On Saturday, I met up with Carrie and Leslie for a 12 mile run. 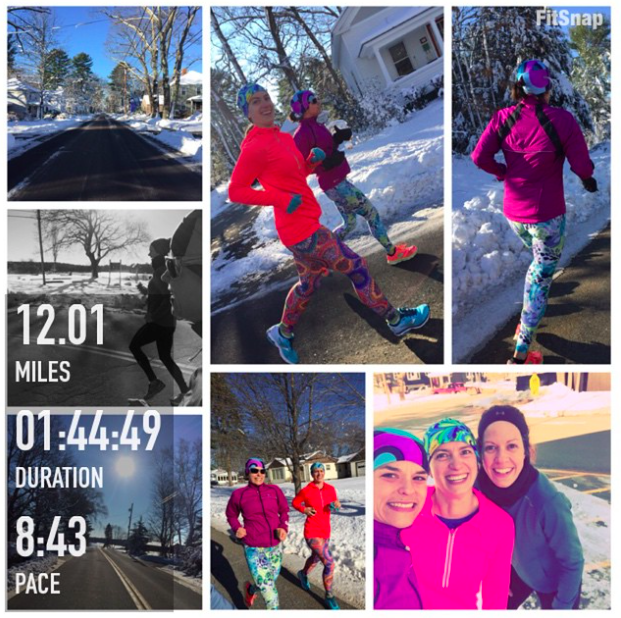 It was a very chilly run - started out in the upper teens and was mid 20's by the end of the run. I'm rather thankful it was sunny and there was very little wind, which made the weather conditions much more bearable. However, the company was fantastic! Looks like Carrie and I love Spandits? Right? Well, we do. You should buy some today. (Cyber Monday - in stock items at Spandits are 25% off!!!) -- tell the ladies that Jen (and Carrie) sent you. Then Sunday, the temperature was warmer, but it was overcast and raining in the morning. I started out by trying to get to the gym for my shift, but lost control of the car less than a mile from the house and went off the road. Luckily there were not any cars in the vicinity, neither Izzy or I were hurt, and the car is fine. I was able to turn around and get home safely...and that is where I stayed for the rest of the day. Later in the day, when the temperature was about 38F, I decided to get out for my run. I had planned on 4 miles, but when I noticed I had 4.68 miles to go to make it an even 160 for the month, I just went with it. Oh look, MORE Spandits. I am addicted! On another happy note, I see that I'm already at 1534.46 miles for 2014. 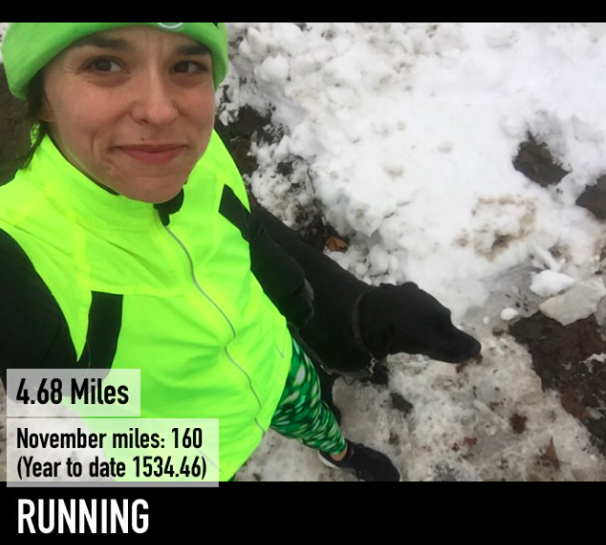 My highest yearly mileage to date is 1600..... so let's see where December gets me! As my mileage increases, my need to refuel with protein continues to be important. I have been using My Protein's Muscle and Strength protein powder, which packs in 20 gram of protein and has a rich, smooth chocolate taste. I have been enjoying Muscle and Strength for meal replacement (breakfast and/or lunch) and even as a recovery shake. I sometimes get creative with my protein shakes, but tend to go back to my simple favorite combination - Almond Milk and a scoop of chocolate My Protein. It always makes for a delicious shake. My Protein has a large selection of protein blends to choose from as well. Check them out! Are you a protein shake/smoothie fan? Have you ever tried My Protein? My plan for today is to get out for 4 miles (or more if time allows) after school. How did you MOVE this weekend? Are you moving today? You are a BEAST!!! Are you secretly training for something? 160! You go girl! Glad to hear and and Izzy are okay. It was yucky yesterday morning. I'm done recovering from a relatively evil sinus infection, and luckily it's spin day! I'm off to push n' pull! I've been making protein shakes after my long long runs b/c I'm typically not hungry, but I know I need to get in the calories and nutrients. Glad you guys weren't hurt. AWESOME!! Looks like a great week!! And I love protein shakes post run. I just bought a juicer today, so my shakes are going to be on a whole new level! Amazing number of miles ! I got to my aqua gym class Friday, ran 5Km Saturday but foot hurt slightly, so only did a power walk on Sunday... I can't believe all the snow you had for Thanksgiving ! Glad nobody was hurt during your slippery commute. I hate driving in the snow/ice!